The Russian Soyuz spacecraft with Expedition 15 cosmonauts Fyodor Yurchikhin and Oleg Kotov, along with tourist Charles Simonyi, fly to the space station following launch from Baikonur Cosmodrome. A Dnepr rocket laden with 14 small international satellites flew out of an underground missile silo and soared into space Tuesday on its first mission since failure struck the launcher last year. The three-stage rocket lifted off at 0646 GMT (2:46 a.m. EDT) from the Baikonur Cosmodrome in Kazakhstan. The 111-foot-tall booster worked as planned and its cache of payloads were successfully deployed from the rocket's third stage a few minutes later. 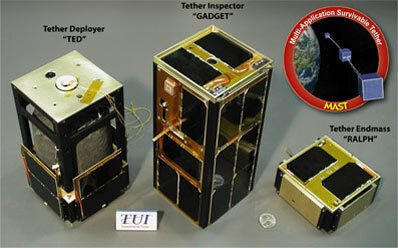 Tiny satellites connected by a tether were among the craft launched aboard the Dnepr. Credit: Tethers Unlimited, Inc. The Dnepr rocket, a retired missile from Russia's strategic military forces, was targeting a nearly circular Sun-synchronous orbit between 400 miles and 500 miles high. The flight marked the Dnepr's resumption of launches after the rocket fell short of orbit and crashed in the Kazakh desert during its last mission in July. Investigators traced the cause of the failure to a glitch in the rocket's first stage control system. Kosmotras, a joint company formed by the Russian and Ukrainian governments, markets the Dnepr booster. Kosmotras officials postponed Tuesday's launch from late March to replace a faulty cable in the rocket's third stage telemetry system, according to the company's Web site. Half of the 14 satellites put in space Tuesday were orbited for Egypt and Saudi Arabia, while seven others were tiny palm-sized craft in the CubeSat program. Three P-POD deployment systems built by students and professors at California Polytechnic State University housed seven miniature CubeSat payloads during launch. The CubeSats were to be ejected from the P-POD devices a few moments after arriving in orbit, according to project officials. The CubeSat program - developed and run by officials at Cal Poly and Stanford University - offers universities and low-budget satellite programs an affordable way to put payloads in space. The largest CubeSat launched Tuesday was the Multi-Application Survivable Tether experiment, which is designed to test the durability of space tethers for Tethers Unlimited, a Seattle-based company investigating concepts for tether propulsion in space. MAST consists of three small satellites unfurled along a thin tether stretching about one kilometer long. The tether, composed of three braided lines about two one-hundredths of an inch thick, will be deployed by springs about a week after launch. "We have developed a design for a tether structure that we believe will enable space tether systems to survive in the space environment for long durations, and we hope that the data that MAST collects will prove that it works," said Robert Hoyt, Tethers Unlimited chief executive officer. The middle satellite on the tether will slowly crawl along the length of the tether to look for signs of damage to the structure. Called Gadget, the tiny craft will begin operating about a week after the tether is unfolded. Observers on the ground should be able to spot MAST as it flies overhead shortly before sunrise and after sunset. The craft will be seen as a small line about one-seventh the diameter of the Moon as viewed from Earth, according to Hoyt. Developed for less than $1 million using a combination of NASA contract money and private funding, MAST is the company's first satellite. But officials hope additional craft can be launched in the future to further test tether concepts. Two other projects are under development by Tethers Unlimited engineers to take the next step in demonstrating space tethers. One would use a tether to propel a 22-pound satellite past the Moon, but funding for the missions is uncertain, Hoyt said in an interview. Tethers provide an alternative for space propulsion using momentum to send spacecraft into higher orbits. Space tethers can also produce electricity as they interact with Earth's magnetic field, according to Tethers Unlimited. The Dnepr rocket also launched a nanosatellite testbed built by Boeing. The craft contains four diminutive microcontrollers, each of which can process more than 300 million instructions per second. The spacecraft will demonstrate systems to be used by Boeing in future satellites. Other CubeSat payloads included CAPE 1 for the University of Louisiana at Lafayette and Libertad 1 for Universidad Sergio Arboleda in Colombia. The Aerospace Corporation also launched their first two-pound CubeSat spacecraft and Cal Poly will operate two development satellites hauled to space aboard the rocket. Seven remote sensing and communications satellites were loaded on the Dnepr launcher for Tuesday's mission. The Ukrainian Yuzhnoye design bureau built the 220-pound EgyptSat spacecraft under a contract with Egypt's National Authority for Remote Sensing and Space Sciences, a government agency tasked with gathering and studying satellite imagery of the Earth. Yuzhnoye engineers designed and manufactured EgyptSat 1, and Ukrainian trainers are helping Egyptian officials create satellite control facilities and upgrade ground stations, according to the National Space Agency of Ukraine. The craft is fitted with cameras to take pictures of Earth, but Egypt is not providing details on the resolution and clarity of EgyptSat 1's imagery. The government agency operating the spacecraft specializes in monitoring natural resources, environmental changes, and large-scale disasters, according to its Web site. SaudiSat 3, another small Earth observation craft, was also sent to orbit aboard the Dnepr rocket. The satellite was launched for Saudi Arabia's King Abdulaziz City for Science and Technology. The Saudi government agency will also manage five 26-pound SaudiComsat communications satellites launched Tuesday.